In 2008, Allen Williams bought additional acreage to expand his farm in northeast Mississippi. He applied Adaptive High Stock Density grazing methods over the next four years and documented the changes to forage conditions and soil health. In Northeast Mississippi in the heart of the Black Belt prairie, a farm consisting of approximately 1,000 acres was acquired in the fall of 2008. The farm had had been completely mismanaged and was choked with weeds and brush with little perennial forage base (Picture 5). Cattle were stocked on the place during the winter of 2008-2009 and bale grazing was implemented to start the soil building process. During the first grazing season of 2009, spring-calving cows were grazed at high stock densities of 100,000 lbs. /ac and higher with daily and even multi-day moves in order to stimulate soil biology and to control prolific weeds. Cattle primarily consumed weeds such as ironweed, ragweed, pigweed, and thistle, along with grazing perennial forages (Fescue, Bermudagrass, Dallisgrass, Johnsongrass,) that were growing sporadically throughout the farm (Picture 6). Stocking densities were high so the desired trample would be accomplished. No mechanical or chemical intervention was applied and no seeding or over seeding was done. The purpose of the grazing method was to stimulate the latent seed bank to provide “reseeding”. Each grazed paddock received extended rest periods of 90 days or greater before re-grazing. Cattle quickly learned to readily consume all plant materials in front of them and would strip the leaf material from ironweed and ragweed (Picture 7). Cow/calf pairs grazed the farm all through the warm season grazing period the first year with no loss of animal performance and no supplementation other than mineral. 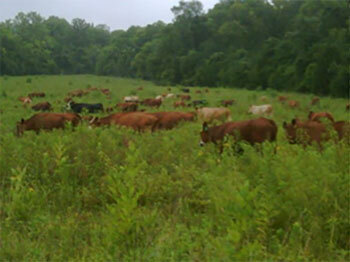 High stock density/short duration grazing was applied through the next four grazing seasons. Changes in soil organic matter (OM), soil microbial population, water infiltration rates, and plant species diversity were significant. 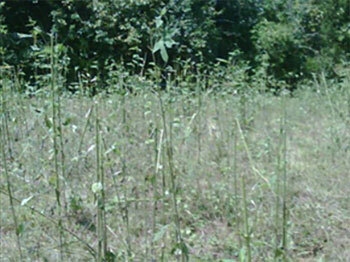 No seeding or interseeding, mechanical or chemical intervention was performed throughout the four year period. At the end of four warm/cool season grazing cycles (4 years), soil OM increased from 1.5% to 4.2%, water infiltration rates increased from 0.75 inches/hour to over 4 inches/hour, forage species diversity improved from 3-4 major forage species to more than 24 species, forage DM production increased from less than 1,500 lbs. /ac to over 4,000 lbs. /ac.